The general atmospheric circulation over Northern Eurasia is relatively simple because of its landlocked position. 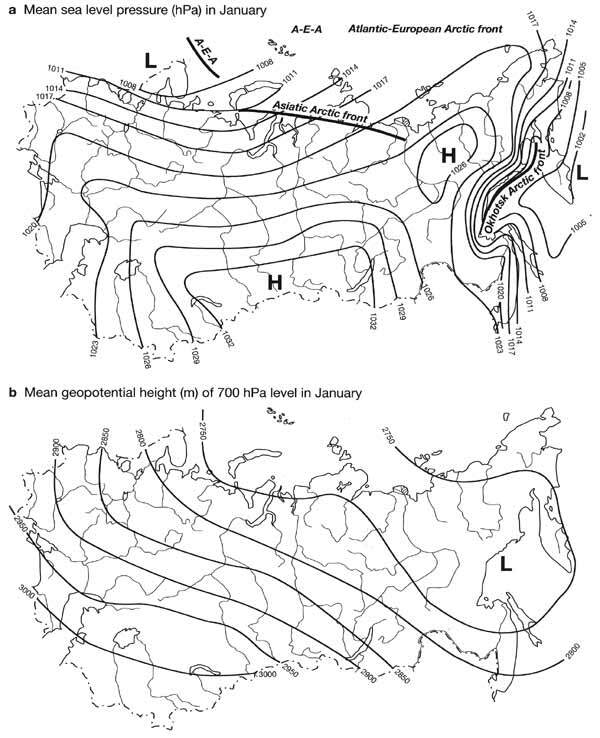 However, surface pressure patterns vary strongly between winter and summer and winter weather patterns can be complex in the European territory and Western Siberia. In winter, a high pressure system, known as the Siberian or Asiatic high, develops in response to strong radiational cooling of the earth surface (Figure 3.1 a). The Siberian high is a semipermanent centre of action dominating Eastern and Central Siberia and Kazakhstan between November and March. Its main centre is positioned over 90-110°E and 40-55°N extending to the north-east where a secondary centre develops over the Yana-Indigirka-Kolyma basins (Sahsamanoglou et al., 1991). The extension of the Siberian high to the east is limited by the Pacific Ocean but it often extends westwards to Europe and south-westwards to the Middle East. Being thermally induced, the Siberian high is a shallow system confined to the lowest 1.5 km of the atmosphere. Already at a height of 850 hPa, high pressure is replaced by a trough extending from the Barents Sea south-eastwards and linking the Icelandic low in the north-west and the Aleutian low in the north-east (Figure 3.1b). The Icelandic low exerts a strong influence on winter weather in the European territory, Western Siberia and northern Central Siberia as depressions, which affect these parts of Northern Eurasia, originate mostly in the North Atlantic. In the European territory, westerly and south-westerly flows dominate in winter and intense depression activity predetermines higher temperatures, cloudiness (which, in turn, counteracts the radiative loss of heat) and precipitation than in the east. South-westerly flow, developing on the peripheries of the Icelandic depression and the Siberian high, dominates over Western Siberia, bringing in air masses either from the European territory or from Kazakhstan and Central Asia. However, when the Siberian high extends to Europe, it effectively blocks the zonal flow and eastward propagation of the Atlantic depressions, displacing their track northwards towards the Arctic Seas. Similarly, depressions originating over the Mediterranean, which usually travel over the southern East European plain to Western Siberia, are forced to deviate southwards to the mountainous regions of Central Asia. The cyclonic activity takes place on the Arctic and Polar fronts. The Arctic front extends along the northern shore of Eurasia (Figure 3.1 a). The Arctic Seas (with the exception of the Barents Sea) remain frozen between October and June and climatically pack ice acts almost as a land mass. Although heat is transmitted through sea ice, it is quickly lost under the clear-sky conditions and during the polar night the radiation budget in the central Arctic Ocean is negative (about -2 kcal cm-2 month-1) and very close to the radiation budget of the Eurasian land mass (Barry and Hare, 1974). However, over the Barents Sea, which is affected by the North Atlantic Drift, and over the offshore areas of weak ice in the Siberian Seas temperatures are higher than over land and a strong temperature gradient exists between the sea and the continent (see below for a further discussion of sea ice conditions). Depressions, originating in the Icelandic low, regenerate over the relatively warm Barents Sea (the area of most intense cyclogenesis and rejuvenation of depressions in Eurasia) and continue along the Arctic front as far as the Taymyr peninsula bringing milder weather to Central Siberia. The positions of the Arctic front show a great range of day-to-day fluctuations and it is not unusual for the arctic air to reach the Black and the Caspian Seas or even the foothills of the Central Asian mountains. The Polar front is generally positioned south of FSU territory. However, depressions, originating over the Mediterranean and the Middle East and rejuvenating over the Black Sea and the Caspian, penetrate into the European territory and Central Asia causing migrations of the Polar front northwards. Therefore, while the general circulation over Eurasia is relatively simple, the two-front system predetermines a great complexity of winter weather over the European territory and Western Siberia. The winter circulation reaches its peak in February. Towards the beginning and the end of the cold season, the intensity and extent of the Siberian high vary and it is often characterized by the development of multiple centres. In April, the Siberian high weakens and its centre shifts westwards to north-eastern Kazakhstan. As the Siberian high dissipates, low pressure develops over Eastern Siberia and the Far East. In the west, an extension of the Azores high builds up. In summer, a weak low pressure zone dominates over most of the Asiatic part while the European part is dominated by the Azores anticyclone (Figure 3.2). Both Icelandic and Aleutian lows weaken and a shallow high pressure system develops over the Arctic. High pressure ridges, propagating eastwards, and the Arctic anticyclones, moving from north to south, maintain the extension of the Azores high. The Arctic front migrates far to the north and only occasionally does it return to the continent, reaching as far south as the forest zone. The depression activity is associated with the Polar front which migrates into the European territory and to the Siberian-Mongolian border. Soil moisture is high across the forest zone where evaporation occurs at a substantial portion of its potential rate. The Eurasian forests are almost as effective in supplying water vapour to the atmosphere as the oceans and the Atlantic depressions are known to bring precipitation as far eastwards as Lake Baikal. By contrast, the Polar front, which does affect the mountains and foothills of Central Asia in spring, dies out over the deserts in summer. The origin of the mid-latitude aridity has been given much attention in recent years. While the existence of subtropical deserts received dynamical explanation long ago, the development of mid-latitude deserts, which stretch from the shores of the Caspian Sea to northeastern China, has been traditionally attributed to the enormous distance from oceanic sources of moisture enhanced locally by the presence of high mountains blocking the entrance of humid maritime air masses (Trewartha and Horn, 1980). However, students of paleoclimates know that the onset of desert expansion in Eurasia coincided with the uplift of the mountains which now extend along its southern rim (see below). The evidence from the past suggests that it is orography that exerts the primary control over the large-scale atmospheric circulation and precipitation in the middle latitudes (although the role of contemporaneous changes in the distribution of continents and global Cenozoic cooling should not be disregarded). This evidence, suggesting a connection between orography and the distribution of the Eurasian mid-latitude arid climates, has been corroborated by climatic modeling which simulated Eurasian climate with and without mountains (Manabe and Broccoli, 1990, 1992). Precipitation in the middle latitudes is associated with atmospheric depressions propagating along the Polar front. The preferred position for the development of depressions is controlled by the position of stationary planetary waves in the upper atmosphere. Depression activity is strongest and precipitation is heaviest downstream of the stationary wave troughs, in the area of large-scale ascent of the air. By contrast, upstream of the troughs, in the area of large-scale descent, synoptic activity is weak and precipitation is light. The position of the stationary waves and their amplitude are, in turn, determined by the distribution of the oceans, continents and large mountainous barriers. The mountains of interior Asia, and particularly the Tibetan plateau, split the upper-air westerly flow into two jets. One jet is displaced southwards and flows over northern India; another one is displaced northwards and flows over northern China. This displacement induces the position of stationary waves in such a way that an upper-air trough is associated with the Tibetan plateau. Large-scale subsidence and weak depression activity occur upstream of this trough, over Central Asia, while ascent and frequent development of storms occur downstream. During summer, upper westerlies retreat further north where they are affected by the relatively low mountains. Although the westerlies do not impinge on the Tibetan plateau, the plateau still exerts its influence on the climate of Central Asia via the remote influence of the Asian monsoon. The intense heating of the surface results in the formation of a thermal low centred over the south-eastern part of the Tibetan plateau. Associated with this low is a circulation extending from east to west. Intense ascent, aided by the release of latent heat, occurs over the south-eastern slopes of the plateau where large volumes of air, rising from the surface, are matched by the outflow in the upper atmosphere. The outflow of air gives rise to a jet which flows eastwards and subsides. The overturning of the monsoon circulation is discussed in many texts on tropical climatology (e.g., McGregor and Nieuwolt, 1998). It is the localization of the descent that is important for the development of deserts. The Kyzylkum and Karakum deserts of Central Asia are one of the centres of descent. Thus the adiabatic subsidence of air flowing out of the monsoon region appears to be a factor responsible for low precipitation in Central Asia. However, recent modelling studies by Rodwell and Hoskins (1996) have shown that the descent mechanism does not represent a simple monsoon overturning. The observed and modelled descent is a result of the interaction between the monsoon heating and the southern flank of the mid-latitude westerlies (monsoon heating enhances subsidence of the westerly flow) and orographically induced anticyclonic circulation (which localizes the area of descent). The combined effect of these factors is adiabatic warming of descending air, reduction in specific humidity, lack of convection and clouds. However, modelling shows that the adiabatic descent is not sufficient to generate the observed aridity by itself but it initiates radiative cooling in the cloud-free atmosphere which intensifies the descent further. Therefore, the aridity of Central Asia originates from the combination of circulation and radiative factors. Directly affected by the East Asian monsoon is the Russian Far East were seasonal reversals of atmospheric flow occur along the Pacific coast. In winter, cold air moves out of the area dominated by the Siberian high in a southerly direction towards Japan and mainland Southeast Asia. In summer, the subtropical high in the Western Pacific expands northwards and south-easterly flow emanates from its flanks. 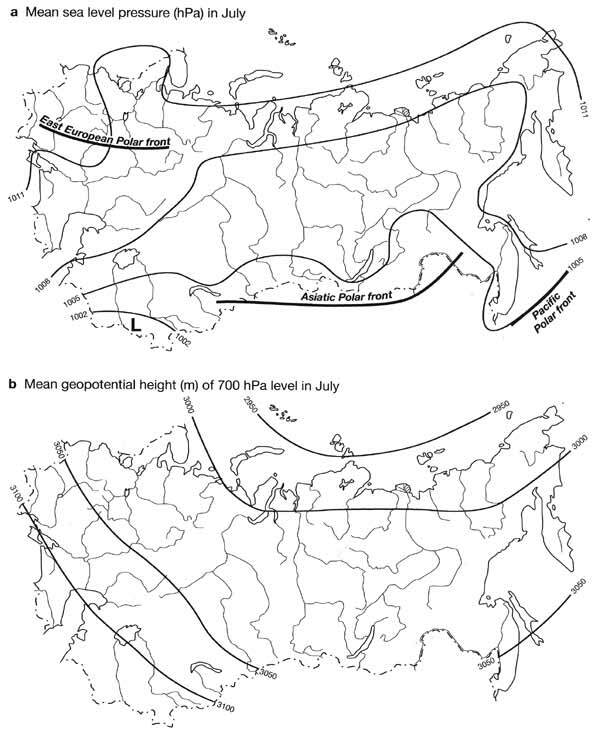 An important feature of the summer monsoon in the Russian Pacific is a distinction between precipitation regimes in the early and late summer. In spring and early summer, a localized area of high pressure develops over the cold Sea of Okhotsk where floating ice remains until midsummer and the southern Far East is affected by the relatively cold and dry air which provides little rain. The summer monsoon does not reach its full extent until the second half of summer and early autumn (see below).